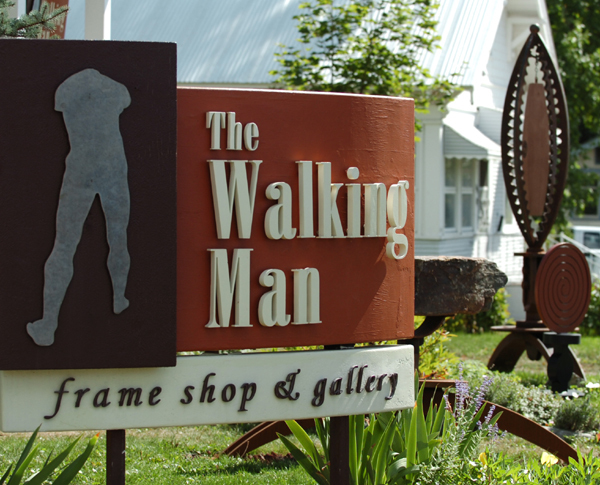 Custom picture framing and a contemporary art gallery are featured at The Walking Man Frame Shop & Gallery. We are located in the wonderful mountain town of Whitefish, Montana and a stone’s throw from Glacier National Park. We offer a wide variety of custom framing services: from dry-mounting & canvas stretching to hand-wrapped fabric matting, fillets, archival techniques (which we highly encourage) & custom mirrors. We are involved with the ever-popular Whitefish First Thursday Gallery Nights events that happen May through October-a special one night a month happening of fine art and refreshments. Go to http://www.whitefishgallerynights.org for more information on that! !